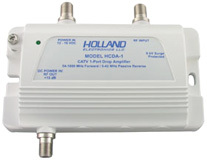 The HCDA Series is the top of the line CATV amplifier. Powder coated paint, sealed F ports, and an RFI and hermetically sealed back plate make the HCDA amplifiers unsurpassed in environmental ruggedness. Note: Too many times, you're stuck trying to fix the no man's land between your Home wiring, and the Cable TV Company Feed from the Pole or Pedestal. Old Installation cable and years of Up-Grades, Additional Outlets, Changes, Modems and High Definition leaves you with a distribution system beyond what was originally envisioned. The Cable TV Company will be happy to Charge you to go through and Re-Install your Home, or you can do it yourself! With HD Digital Signals, the Signal Level is actually lower than the analog, and with increased Channel Capacity, not enough is there to feed your Home. Check Your Picture quality where the Cable TV feed enters your Home, if it's good there, you can replace connectors, cable and Splitter to bring your installation up to the newest specifications. If you are feeding numerous TV sets, Cable Modem and/or long Distances, use this Amplifier before the Splitter To maintain Signal Quality. This Amplifier features an Active (Amplified) Return band section to overcome passive losses that after Modem and Set-top suffer when communicating back to the Cable TV Company. What's nice about an Indoor/Outdoor Inline amplifier is you can put it in anywhere, and move it to anywhere else later! Just use a Barrel Connector (F-81) or short jumper to reconnect the cables together in absence of the Amplifier you removed. If the Picture quality is Poor at the Feed point of your House (the Cable Company usually has a Grey box used as a Demarcation Point for this Purpose), call your Cable TV Technician and Demonstrate to him your issues, so he can effect repair.